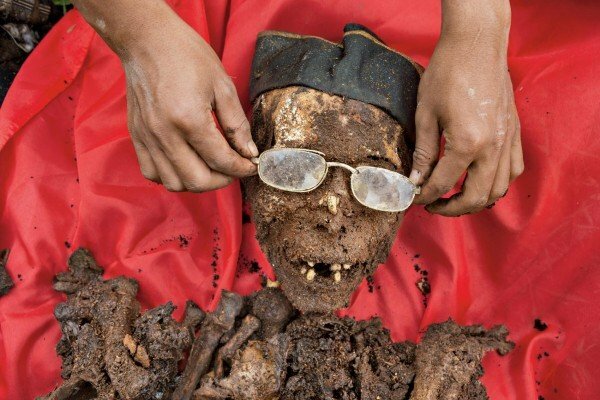 In most cultures, desecrating a grave or removing a corpse is viewed with disrespect, but for villagers on the Indonesian island of Sulawesi it is just the opposite. In the United States if you fail to report a deceased person you could face legal penalties, but here it’s considered normal behavior. This unique culture has the unorthodox tradition of living with the bodies of deceased loved ones at home for periods of weeks up to a few years. As if that wasn’t strange enough, every few years they go back to the grave and exhume the body revering them with a change of clothes and ritual known as Ma’nene’. And it’s all meant as a way of showing deep respect to their elders. National Geographic brings us this extraordinaire story and video of the Torajan people. For this reason, when a person dies they are fed food and drink, including formaldehyde to preserve the body and keep the smell down. They continue to share meals, pray with them and change their clothing. For the full story visit National Geographic.